Their three rich, bold and luscious offerings—Butter Chardonnay, JaM Cabernet Sauvignon and Toast Sparkling—more than live up to their names. Butter melts in your mouth, JaM slathers you with berry goodness, and Toast puts a celebration right in your glass! Second generation Napa Valley vintners John and Michele Truchard are the JaM in JaM Cellars. 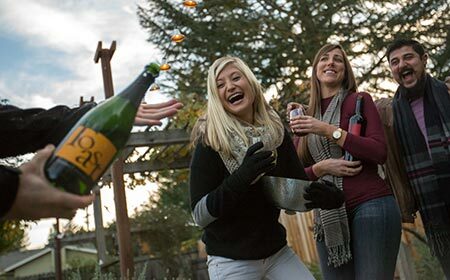 After almost a decade crafting ultra-premium wines in the Napa Valley, the Truchards decided to make some more approachable wines that could be enjoyed anytime—whether that’s a special occasion, everyday celebration, or just a day of the week with a “y” in it! John and Michele love making these wines, and have a ton of fun sharing them. Thank you for loving JaM!